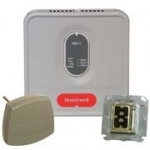 Honeywell HZ311K 1 Heat / 1 Cool TrueZONE Zoning Kit. Includes TrueZONET HZ311 Panel for conventional, single stage applications up to 3 zones. Also includes discharge air sensor and transformer. If you've ever installed a zoning system by setting manual dip switches, you'll appreciate the convenience and time savings of Honeywell TrueZONET panels. Patented, digital installer setup and push terminals for wiring means no screwdriver is required. Plus, TrueZONE's standardized checkout process helps eliminate callbacks by ensuring that the system is operating properly before the installer leaves the jobsite. It all adds up to true comfort for your customers and true profit for your bottom line. Robust Push Terminals - Push-in terminal blocks wire in literally half the time compared to screw terminals - with no screwdriver required. Plus, wires lock-in to the terminals for a tight fit. Common-Sense LEDs - Indicate which zones are calling, what stage they are calling for (heat/cool) and when the emergency heat is on. Universal Application - TrueZONE panels work with virtually any brand equipment for zone control of conventional, heat pump or dual fuel systems. Clean, Professional Installation - Patented wire channel allows installer to run wires on the side, top, bottom or backside of the panel and wire anchors help hold wires in place. Smaller Footprint - Gives installer the ability to mount TrueZONE panels anywhere - on the return duct, studs or wall next to the system. All panels are eight inches wide. Variable-Speed Fan Control - Reduces blower speed in cooling when one zone is calling.